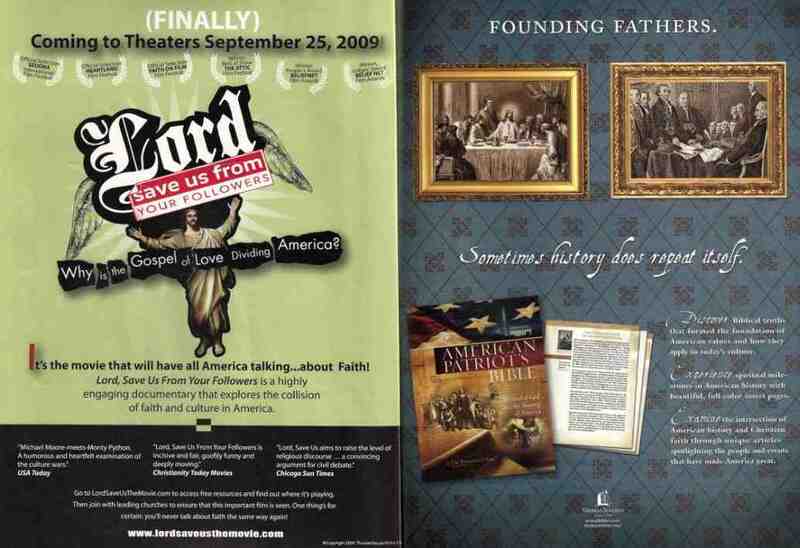 This unlikely pair of mutually illuminating ads appeared on opposite pages in a popular evangelical magazine a couple years ago. After narrowly averting the inclination of my gag-reflex, I laughed out loud at the sad irony. (You'll want to click it to enlarge and read the text). Lord, Save us From Your Followers, the movie, poses a question as a subtitle: Why is the Gospel of love dividing America? To which the opposite page would seem to provide a clue with the suggestion that the Last Supper and Signing of the Declaration of Independence were moments when history repeated itself. The second ad is peddling the American Patriot's Bible. I can't help but wonder if the pairing was the unspoken commentary of an editor...or divine happenstance. Watch Lord, Save us From Your Followers free on hulu.